My family and I had our first service with your cleaning company today and it was all that you promised and more. Your employee is wonderful. I surely hope she will return every other week. She cut no corners and all the while eco cleaning. I am truly amazed! 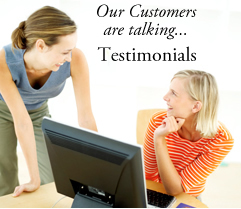 This is the first time that we are 100% satisfied with a cleaning company. And believe me, we have tried a few. It is such a plus knowing that the products you use to clean so well are also friendly to ones health. All I can say is: "Thank you for your great service and thank you for the founding of your company." My family and I are wishing you all the success in the world for the reasons mentioned above, but also because we want to continue to benefit from your unmatched cleaning service. I must tell you that this week the girls did such an outstanding job on my house. Words cannot say how pleased I am with the work they did. My husband noticed it too! Two days later and it still feels so fresh and clean. Please let them know. I absolutely adore my cleaning girl She is a wonderful worker - but also very pleasant to have in my home. It is so wonderful for me to relax about the housekeeping, the ecological impact of it, and the support of the environment. I love your business. I just got home and my house looks so amazing!! No nasty chemical odors and everything is shining!! Thank you sooooooo much! I wanted to thank you for the great service. The cleaner was wonderful. She did a fabulous job! Thank you again for having the girls come at a different time last week. It made things so much easier for me this past weekend when I had guests.